My supply of pumpkins and squash has been steadily declining but I still had some left. I do not normally make yeast based breads all that often but when I came across the idea of pumpkin dinner rolls I knew that I would have to try them. I figured that serving them with the squash chili mole would be perfect. As a yeast based bread they take a bit of time to rise twice so you have to time them right if you want them to be fresh out of the oven (and that is when they are at their best) when you sit down to eat your meal. Other than the timing you have to do a bit of kneading but the rolls were pretty easy to make overall. The pumpkin dinner rolls turned out pretty good. They were nice light and fluffy with just a hint of pumpkin flavour. I had a hard time saving a roll till the end to clean the last of the chili sauce from the bottom of the bowl. I could not resist eating one right as it came out of the oven with some melting butter. This time in addition to the melting butter I tried drizzling some honey onto the roll as well and it was so good! I am going to have to bake bread more often. Mix the yeast, sugar and milk in a bowl and set aside. Mix in the flour, nutmeg, salt and sugar in a large bowl. Slowly mix in the oil. Mix the yeast mixture, egg, pumpkin puree into the flour mixture until it forms a dough. Knead the dough on a floured surface until smooth and elastic-y adding more flour as required. Place the dough in an oiled bowl, cover and let rise to double its original volume, about 1 hour. Place the dough on a floured surface and form it into a disc. Cut the disc into 16 pieces and form them into balls. Place the balls in an oiled spring form pan. Cover the pan and rise to double its original volume, about 1 hour. Mix the egg and water and brush onto the top of the dough. Bake in a preheated 350F/180C oven until golden brown, about 30-40 minutes. Looks fantastic! I love the color of the rolls. This is just blowing my mind. I was looking for a bread recipe all day long but couldn’t find one I like. This is definitely something I want to try. I’ve been checking Closet Cooking every day for about a month now and I have tried some of your recipes. They are all stored in my recipe box, including the pumpkin cranberry bread a few days ago – It was absolutely delicious! I cannot wait to bake these dinner rolls tomorrow. Thank you so much for great recipes! I really like it, l also like the color very much. I’ve made challah with pumpkin before, and it was delicious. I must try to make pumpkin roll, one day. Do you have any left? I am having morning coffee and a pumpkin roll would just be the right thing to have!! They look good! As Jessy said – I love the color of them! The rolls look delicious! Love the colour. Reminds me of the beauty of fall colours. What beautiful rolls! Terribly scrumptious! There is nothing to compare bread fresh from the oven .. those rolls look great! Pumpkin dinner rolls sound yummy! When I think of pumpkin anything, I think of dense batters or pie. These rolls look light and fluffy. Wow! 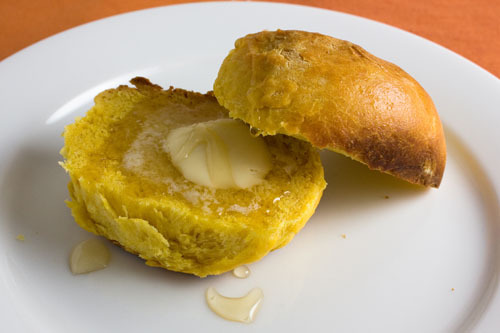 Pumpkin in a dinner roll is such a great idea. I wouldn’t be able to resist eating the roll from the oven either! I love baking yeast bread on the weekend to have throughout the week, and these rolls look like a delicious addition to my archive. The honey on top looks amazing. I bet these would make great PB, Banana, and Honey sandwiches! Those look delicious! Your ability to create new things all the time blows my mind! Love the photo! Bravo! I was just getting ready to print your chicken picatta recipe (for tonight’s dinner) and I saw this. I’m going to make this tomorrow. Love the color! I have a ton of pumpkin sitting in my fridge so this might be the right recipe! Looks so wholesome and pretty. Like the melting butter and honey. Who doesn’t? Kevin, thanks for telling me the pan. I love chicago metallic, but the only place I ever find Chicago Metallic pans is at Caynes and they didn’t have the 9×5 the last time I went. Btw, have you ever been the ashley sale? I’ve never knew about it until this year.. well I did except I thought it was only China and fancy plates (TV guide ads). They extended it so I’ll definitely get a chance to go once my exam is over!! That looks so good! I’ve been meaning to try a pumpkin or a sweet potato roll. wow!! Kevin your dinner roll look greAT!I wanna to try to make big dinner roll but can’t find a good recipe which make the roll light and fluffy in the middle.. These would be extra lovely with a bowl of soup Kevin. The smell must have been gorgeous, drifting around the kitchen. I like these! They sound great, and look pretty too. Great idea Kevin. Who needs anymore than this for dinner. What a bearutifully colored roll. this looks sooo good -can’t wait to try them! Your rolls looks so delicious! Pumpkin cinnamon rolls are a favorite of mine, and now I have to try pumpkin dinner rolls. I love fresh baked rolls! I made sweet potato rolls for Thanksgiving, and now I think I’m going ot have to try these! yes, kevin, you ought to make bread more often! I’m so addicted to making bread! These rolls are ABSOLUTELY delicious!!! I used canned pumpkin (sorry, I didn’t feel like going through the “puree-ing” process this time…), and added a dash of cinnamon. I had hard time getting the dough rise due to the weather (it was cold), so I had to do this “boiling water in the oven” trick. But it was worth the trouble. We had them with soup right as the rolls came out of the oven. They came out so good – looked like the ones at a bakery store. And Mmmmmm, they tasted SO GOOD, too! We enjoyed it very much. This is a keeper. Thanks for the recipe! I had trouble getting 16 pieces into the spring form pan. They are in the oven now so we’ll see what happens. Thanks for the recipe. I had tons of longneck pumpkin leftover from November. I too came up with more than 16 rolls. I rolled them into 24 2" balls and they still raised enough to be the size of hamburger buns. I made 24 too vs 16, also used butter vs oil in the recipe. If you cook the pumpkin down a bit with spices it has a richer color. Also if you mix a stick of butter with a bit honey and a sprinkle of cinnamon instant heaven with these rolls which are lovely.